It has now been about a week since the 2016 YMCA General Assembly in Kansas City. Now that we were able to take a breather as well as all the attendees and vistors, it is time to think about how the show went! First of all, we must say thank you again to every single person that made it to our booth to talk to us, to play on our equipment, and/or to just experience exergaming. It was truly special to meet all sorts of new faces from different YMCAs, as well as seeing some old friendly faces that got to see how far we have come, and us to see how far they have as well. It was wonderful to meet some CEO/Executive Directors of some YMCAs we have some previous work with before – installing exergaming equipment and putting together Youth X fitness rooms. To see the amount of success they have had with their equipment shows us that our interactive fitness pieces of effective and engaging for years to come. 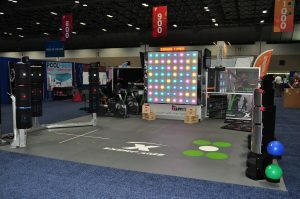 We were able to bring some top selling products to the show like the T-Wall 64 and the Fit Interactive 3-Kick and Heavy Ball. As well as some smaller youth fitness pieces like the Exerbike system and the MotionTouch Magix – as well as some complimenting Pavigym 2.0 flooring. 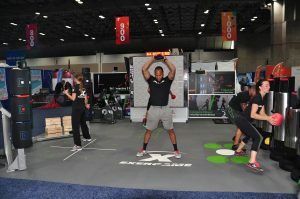 Throughout the show, we were able to have some trainers perform some fitness circuits on the machines to show attendees the proper way to use them. Then we encouraged the attendees to jump in at any time to test out some of the equipment. 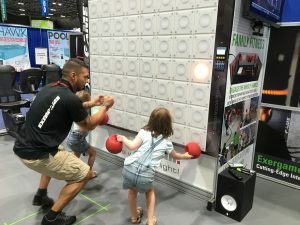 We had people of all ages coming to try it out – showing that these are truly tailored not only for high-intensity training but family fitness as well. This was also our first show to hand out our Poker Chips that allow you to enter our Weekly/Monthly prize drawings. So if you received one, don’t forget to enter and keep coming back for your chance to win Exergame prizes! If you would like your own poker chip to enter, click here to request a FREE catalog and have the chip sent along with it! Check out a few photos of the show below. You can view the whole gallery here. Again this show only comes every 3 years, so it was incredibly gratifying to have such a successful and engaging booth at this year’s YMCA General Assembly. The next one is not until 2019, but it will be here before you know it! So once again thank you to everyone who came out – we hope to deliver Exergaming to YMCAs for years to come! Our next stop on the trade show road is the 2016 NRPA Conference. We will have a booth at the event as always so stay tuned on our Facebook and Twitter pages for more news on the event – and also check out our Instagram page!